Go Green: Greenpeace Activism - Can It Really Be Considered Piracy? 0 Greenpeace Activism - Can It Really Be Considered Piracy? You have probably heard of the 28 activists and 2 journalists that are being held in a Russian jail under charges of piracy and hooliganism. What is getting lost in the media coverage is why they were in the Arctic in the first place and what happened that led to their arrest. Areas within the Arctic, including the Russian Arctic National Park, are in danger of being taken over by over 100 oil drilling platforms. Drilling for oil in the arctic is extremely risky due to the frigid temperatures, the presence of moving sea ice and its remote location. It isn't like when an oil spill occurs in the Gulf of Mexico where there are resources readily available either. There are no such resources in the arctic. Read more on the dangers of arctic drilling here. 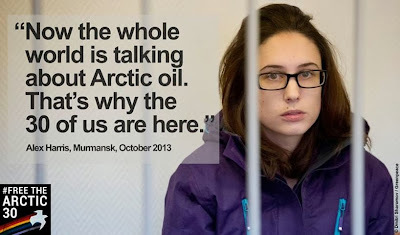 Greenpeace wasn't just there because Gazprom was setting up their drilling operations in the fragile arctic environment. They were there because of the notoriously poor safety and environmental record the company has. A spill of any nature in the arctic will have grave consequences to the ecosystem. A company drilling for oil there with no spill plans or viable safety equipment to deal with spills is a time bomb waiting to happen. 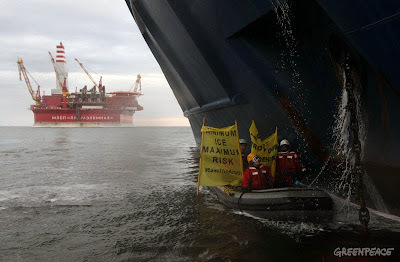 In mid September the Greenpeace ship, the Arctic Sunrise, sailed into international waters in the arctic to shed light on the dangers of drilling for oil in the arctic. They had been there before and had heard directly from those who are supposed to protect the waters that oil is king in Russia. 2 of the activists tried to climb the side of the platform to hang a banner, which is a normal operation for Greenpeace during their protests. They were met with guns to their faces. Camila, a 21 year-old activist from Argentina shares her experience during the protest. Amongst all the commotion I heard a gunshot. They were shouting at us in Russian so I couldn't understand what they were saying but they were pointing guns and knives at us so I knew they were threatening us. All we could do was raise our hands and explain that we were here to protest peacefully. Then I heard another shot. [...] Half an hour on and the guns were still being fired into the air and water. [...] The gunshots continued and I wondered how far these people were willing to go to stop us from peacefully protesting against Arctic oil. I followed the next day on Twitter as Greenpeace live tweeted the dramatic events that followed. Russian security services descend to the ship (that was in International Waters) from their helicopter and seize the ship at gunpoint. They try to break into the comms room to shut down all communication with those not on the ship. It took a little while but they got in and all communication halted. 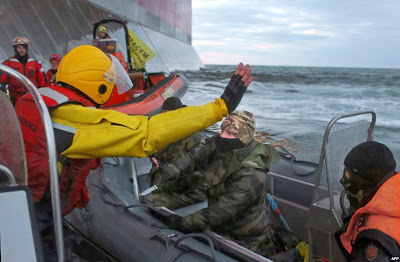 The Greenpeace activists were arrested, charged with piracy and denied bail. That charge was later changed to hooliganism but it still carries a sentence of jail time. Is what Greenpeace did a crime? I believe that at most the act of scaling the side of the oil drilling platform with ropes is trespassing. Any activities they conducted in International Waters aboard their own boats are not illegal. I don't believe that all 30 people should be currently in jail and standing trial. 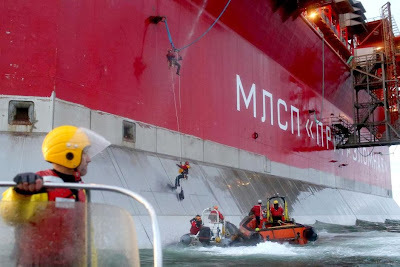 I believe that the protest was peaceful on Greenpeace's part and that the Russian authorities used aggression that was unmatched and not required for the situation. The use of guns and knives and ramming the Greenpeace boats was completely uncalled for, and frankly unsafe. What do you think? Do you think what Greenpeace did was illegal? Does it warrant the charges?